Subtitle: Render the Constitution Enforceable. While we enjoy yet another year of the Trump Renaissance, we should still consider the future. One thing is certain. The Trump era ends no later than January 20th 2025. Then what? Shall we risk our Liberty on replacing President Trump with another person of superior public virtue? The horrid fact remains that Congress is but a shadow of its 1787 design. Most members would gladly never cast another recorded vote if it ensured reelection. As a consequence, Congress, through both neglect and assignment, watches without complaint the drift of its powers to the executive and judicial branches. The ambition and avarice of so many depend on Congressional and Presidential elections that otherwise honest people sink to the lowest levels of depravity to guarantee a favorable outcome. Remember chuckling not long ago at raucous and fraudulent Central American elections? They’re here, and now they aren’t funny. Despite our slide, a common call from some conservatives is to “just enforce the Constitution we have.” In a perfect world of cuddly puppies and chocolate rivers, we should simply elect the secular saints in our midst. At least a few are around, right? The problem is far less about a shortage of virtuous people and far more about the slow, imperceptible corruption of our institutions, beginning with the Senate in 1913. So, public virtue is an insufficient foundation. Republics (government which is to be administered by men over men) face problems (great difficulty) unrelated to monarchies and despotisms. Ultimately, government means some level of coercion (enable the government to control the governed) either through law or outright force. Suffice to say, the US government mastered control of the governed. What about the last clause (oblige it to control itself) regarding government, that of limiting itself? Madison closed with, “A dependence on the people is, no doubt, the primary control on the government; but experience has taught mankind the necessity of auxiliary precautions.” Consent of the governed? Yes, but don’t rely on public virtue alone. Madison’s observation wasn’t conjecture; it wasn’t complex philosophy or distant history; it was recent history and current events. Given the abuses by George III, the first State governments were understandably democratic, too democratic in that they relied far too much on public virtue. When the States closed the front door to executive tyranny, they left the back door open to majoritarian tyranny. The mythical era to which Article V opponents attach oodles of public virtue never existed outside of their imaginations. That is, the structure of government is all-important. Insofar as supporting or hindering freedom and happiness, governmental structure trumps the significance of virtue or licentiousness of the people. Far from embracing simplicity or counting on public virtue, the Constitution set up the most complex republican system in history to prevent the accumulation of legislative, executive, judicial powers in one, few, or many men. That should sound familiar as well, and if a little time is spent in rational thought, it should be clear that is not the system we live under today. The classic, stoic republicanism that charmed many in 1776 was an ideal, but out of reach principle. Americans liked the fruits of their labor far too much to moderate their pursuit of happiness through money. President Trump is a unique, once in a century phenomenon. America dodged a bullet in 2016; it pulled back from the brink of tyranny. But President Trump is a pause. He offers breathing room and time to take stock of our situation. Instead of the dangerous and anti-republican reliance on individual savior-Presidents, or the utopian and unrealistic belief in virtuous politicians, the road to free government renewal begins with restoration of the Framers’ Congress. That means return of the Framers’ Senate. 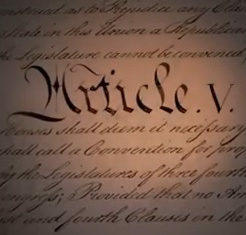 Nothing less than repeal the 17th Amendment through a Convention of States can render our beloved Constitution enforceable once again. 1. Wood, G. S. (1969). The Creation of the American Republic 1776-1787. Chapel Hill: The University of North Carolina Press. 96. 2. Wood, G. S. (1991). The Radicalism of the American Revolution. New York: Vintage Books. 264. In 1789, Senator William Maclay saw at the outset what was happening. He found the basest selfishness in almost every senatorial transaction. Exploitation of office for profit.